JDR, supplier of subsea power cables and umbilicals to the global offshore energy industry, has officially opened its European service centre in Newcastle upon Tyne, UK, to deliver greater service value for clients and facilitate continued growth. 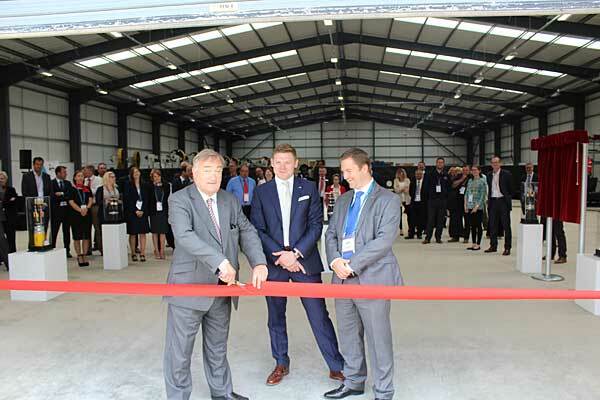 The opening was marked by an official ceremony led by Nick Brown, MP for Newcastle upon Tyne East followed by a tour of the 4,000 m2 facility. The multi-purpose centre includes a workshop, warehouse, visitor centre and state-of-the-art offices. The facility – which will house up to 50 staff – will also serve as the central base for JDR’s European service operations and the company’s sales and marketing functions. The location was strategically selected for its proximity to projects in the North Sea and Europe, JDR’s manufacturing facility in Hartlepool and the local supply chain, allowing JDR to rapidly respond to client needs and provide additional service value. Friday’s opening ceremony also coincided with a contract signing with Tideway who selected JDR to provide termination and testing support for the inter-array cables scope of work for one of their offshore wind farms currently under construction. JDR has been awarded a number of projects for major clients this year including 11 Wells and East Anglia One. JDR has also been nominated as preferred cable supplier for US Wind’s Maryland project as well as by WindPlus for the Windfloat Atlantic project. The centre will be vital in supporting service elements associated with such projects and future contract wins.